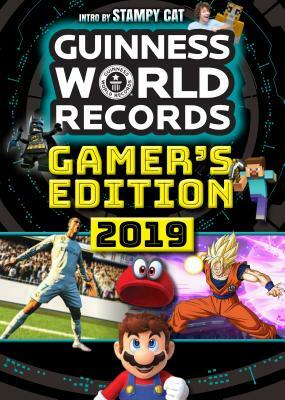 The Guinness World Records Gamer’s Edition 2019 is the global authority on all things videogames. Inside the 12th edition of the world’s best-selling videogames annual you’ll be able to delve into your favorite games like never before – from returning favorites like FIFA, Overwatch, Call of Duty, Minecraft, Super Mario and The Legend of Zelda, to all-new instant classics such as Fortnite, Monster Hunter: World, Dragon Ball FighterZ, and NieR: Automata. Inside you’ll be able to delve into your favorite games like never before – from returning favorites like FIFA, Overwatch, Call of Duty, Minecraft, Super Mario and The Legend of Zelda, to all-new instant classics such as Monster Hunter: World, Dragon Ball FighterZ, NieR: Automata and Fortnite. You’ll be able to discover who the best FIFA 18 player in the world is, the size of the biggest monster in Monster Hunter: World (clue: it’s really, really big), which Overwatch player has healed more players than any other and find out which eSports pro won over $2.4 million in 2017 alone! We’ll also introduce you to some of the most amazing gamers on the planet. From Nathaniel “Nathie” de Jong, the world’s most popular VR-dedicated YouTuber, to Ray “Stallion83” Cox who has the world’s highest Xbox Gamerscore. And that’s not forgetting Joseph Garrett, Stampy Cat himself, who holds one of Minecraft’s strangest records ever – let’s just say cake is involved… Stampy Cat has also provided a special guest intro that you’ll only find in the Guinness World Records Gamer’s Edition 2019. Talk of Stampy Cat brings us speedily to our World Builders special chapter – a well-constructed celebration of the games that let us build, including Minecraft, LEGO® Worlds, Roblox, Terraria and more. You’ll have chance to don your hard hat too by taking part in our Reader Challenges that could put your name in lights in next year’s Gamer’s Edition. So, whether you want to know who the world’s most popular Fortnite player is, see the planet’s biggest Game & Watch, or find out which nation is the best at Pokémon, you’ve come to the right place!